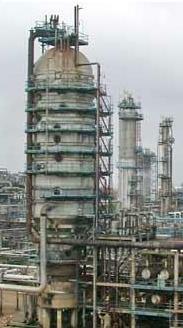 Image 1: A vacuum (science) distillation column in a petroleum refinery. Image 2: Diagram of a vacuum column as used in petroleum refining. Image 3: Dimethyl sulfoxide boils at 189 °C at atmospheric pressure. Under vacuum, it distills at 70 °C. Image 4: Rotary evaporation laboratory setup. Vacuum distillation is the distillation of liquids performed at a pressure lower than atmospheric pressure to take advantage of the fact that reducing the pressure lowers the boiling point of liquids. This permits the distillation of liquids that are temperature sensitive and avoids any degradation of such liquids. Petroleum crude oil is a complex mixture of hundreds of different hydrocarbon compounds generally having from 3 to 60 carbon atoms per molecule, although there may be small amounts of hydrocarbons outside that range. The refining of crude oil begins with distilling the incoming crude oil in a so-called atmospheric distillation column operating at pressures slightly above atmospheric pressure. In distilling the crude oil, it is important not to subject the crude oil to temperatures above 370 to 380 °C because the high molecular weight components in the crude oil will undergo thermal cracking and form petroleum coke at temperatures above that. Formation of coke would result in plugging the tubes in the furnace that heats the feed stream to the crude oil distillation column. Plugging would also occur in the piping from the furnace to the distillation column as well as in the column itself. The constraint imposed by limiting the column inlet crude oil to a temperature of less than than 370 to 380 °C yields a residual oil from the bottom of the atmospheric distillation column consisting entirely of hydrocarbons that boil above 370 to 380 °C. To further distill the residual oil from the atmospheric distillation column, the distillation must be performed at absolute pressures as low as 10 to 40 mmHg (also referred to as torr) so as to limit the operating temperature to less than 370 to 380 °C. Image 1 is a photograph of a large vacuum distillation column in a petroleum refinery and Image 2 is a process diagram of a petroleum refinery vacuum distillation column that depicts the internals of the column. The 10 to 40 mmHg absolute pressure in a vacuum distillation column increases the volume of vapor formed per volume of liquid distilled. The result is that such columns have very large diameters. Distillation columns such those in Images 1 and 2, may have diameters of 15 meters or more, heights ranging up to about 50 meters, and feed rates ranging up to about 25,400 cubic meters per day (160,000 barrels per day). The vacuum distillation column internals must provide good vapor-liquid contacting while, at the same time, maintaining a very low pressure increase from the column top to the column bottom. Therefore, the vacuum column uses distillation trays only where withdrawing products from the side of the column (referred to as side draws). Most of the column uses packing material for the vapor-liquid contacting because such packing has a lower pressure drop than distillation trays. This packing material can be either structured sheet metal or randomly dumped packing such as Raschig rings. Many industries, other than the petroleum refining industry, use vacuum distillation on a much a smaller scale. Laboratory-scale vacuum distillation, sometimes referred to as low temperature distillation, is used when the liquids to be distilled have high atmospheric boiling points or undergo a chemical change at temperatures near their atmospheric boiling points. Temperature sensitive materials (such as beta carotene) also require vacuum distillation to remove solvents from the mixture without damaging the product. There many laboratory applications for vacuum distillation as well as many types of distillation setups and apparatuses. 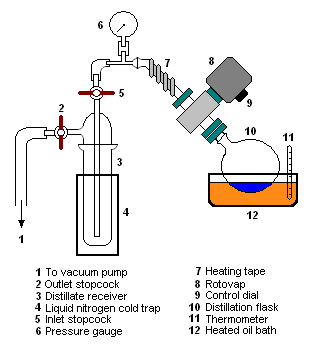 Image 3 is a photograph of a vacuum distillation setup in a laboratory. Safety is an important consideration when using glassware as part of the setups. All of the glass components should be carefully examined for scratches and cracks which could result in implosions when the vacuum is applied. Wrapping as much of the glassware with tape as is practical helps to prevent dangerous scattering of glass shards in the event of an implosion. Rotary evaporation is a type of vacuum distillation apparatus used to remove bulk solvents from the liquid being distilled. It is also used by environmental regulatory agencies for determining the amount of solvents in paint, coatings and inks. Image 4 is a diagram of one such setup. Rotary evaporation setups include an apparatus referred to as a Rotovap which rotates the distillation flask (sometimes called the still pot) to enhance the distillation. Rotating the flask throws up liquid on the walls of the flask and thus increases the surface area for evaporation. Heat is often applied to the rotating distillation flask by partially immersing it in a heated bath of water or oil. Typically, the vacuum in such systems is generated by a water aspirator or a vacuum pump of some type. Some compounds have high boiling point temperatures as well as being air sensitive. 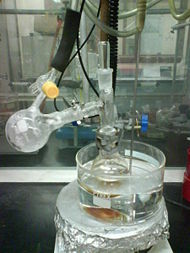 A simple laboratory vacuum distillation glassware setup can be used, in which the vacuum can be replaced with an inert gas after the distillation is complete. However, this is not a completely satisfactory system if it is desired to collect fractions under a reduced pressure. For better results or for very air sensitive compounds, either a Perkin triangle distillation setup or a short-path distillation setup can be used. 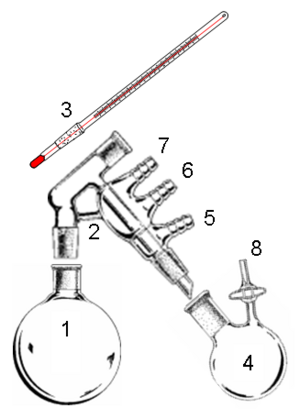 The Perkin triangle setup (Image 5 ) uses a series of Teflon valves to allow the distilled fractions to be isolated from the distillation flask without the main body of the distillation setup being removed from either the vacuum or the heat source, and thus can remain in a state of reflux. 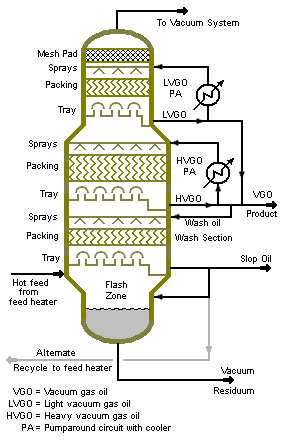 To do this, the distillate receiver vessel is first isolated from the vacuum by means of the Teflon valves. The vacuum over the sample is then replaced with an inert gas (such as nitrogen or argon) and the distillate receiver can then be stoppered and removed and removed from the system. Vacuum distillation of moderately air/water-sensitive liquid can be done using standard Schlenk-line techniques (Image 6). When assembling the setup apparatus, all of the connecting lines are clamped so that they cannot pop off. Once the apparatus is assembled, and the liquid to be distilled is in the still pot, the desired vacuum is established in the system by using the vacuum connection on the short-path distillation head. Care is taken to prevent potential "bumping" as the liquid in the still pot degases. While establishing the vacuum, the flow of coolant is started through the short-path distillation head. Once the desired vacuum is established, heat is applied to the still pot. If needed, the first portion of distillate can be discarded by purging with inert gas and changing out the distillate receiver. 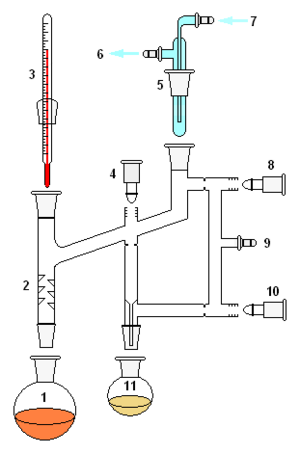 When the distillation is complete: the heat is removed, the vacuum connection is closed, and inert gas is purged through the distillation head and the distillate receiver. While under the inert gas purge, remove the distillate receiver and cap it with an air-tight cap. The distillate receiver can be stored under vacuum or under inert gas by using the side-arm on the distillation flask. ↑ James G, Speight (2006). The Chemistry and Technology of Petroleum, Fourth Edition. CRC Press. 0-8493-9067-2. ↑ Kister, Henry Z. (1992). Distillation Design, 1st Edition. McGraw-Hill. ISBN 0-07-034909-6. ↑ Editor: Richard Darton (1997). Distillationj and absorption '97, Volume 2, 1st Edition. Institution of Chemical Engineers, United Kingdom. ISBN 0-85295-393-3.. This page was last modified 21:40, 23 September 2013.